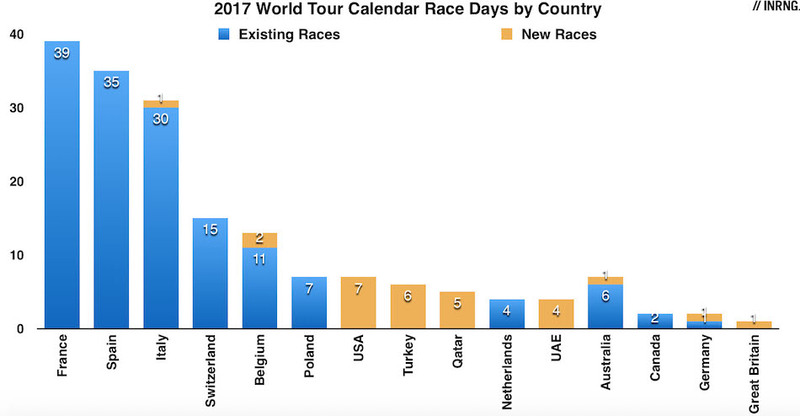 The 2017 calendar is out and the UCI has added more races to the World Tour with 10 events making up a total of 28 extra racing days on the prime calendar. In the coming days we’ll learn more about the qualitative aspect of the calendar with talk of the new events being treated as second grade additions but for now let’s look at the new calendar on a quantitative basis, how its numbers stack up. That’s six one day races, plus four stage races providing 22 days of racing, a total of 28 days extra on the World Tour calendar. This tilts the calendar slightly toward one day races which now comprise 12.8% of the race days, compared to 10.4% in 2016. The chart above shows the calendar by month with the new and the old races. The addition of new events in February is welcome because it fills a gap. The World Tour would begin with a fanfare in Adelaide only to go back into hibernation until mid-March and Paris-Nice. This oddity has been resolved but only by the addition of two races in the Gulf which, while fierce races, are training races for the spring classics and seen as a means to an end but the debate about quality is for another day. For now note it’s said these new races won’t be compulsory nor will their ranking points count which tells us two things: first the additions to the calendar are not pari passu but structurally second rate events; second these details have leaked several times over which suggests the UCI doesn’t want to own them. May is now the busiest month of the year with the Tour of California alongside the Giro d’Italia. These clashes are odd, for example imagine if Formula 1 staged the Monaco GP on the same weekend as the Brazilian GP. But cycling is different, the peloton large enough to cope with two races. Indeed streamline the calendar to avoid clashes and squads would surely slim too? Still the clashes can be contentious. At the end of July there’s a clash between the Tour of Poland, the Clasica San Sebastian and the newly elevated Ride London Surrey Classic. With riders tired from the Tour de France there have been complaints from the teams about having to ride three races on the same weekend so it looks like the new events, like the British race, won’t be compulsory. One of the consequences of this was Velon’s deal with the British race – announced last week – and what the press release didn’t spell out was that the British race is likely to be paying the teams to take part and therefore guaranteeing the presence of the top teams. Presumably the reason why they applied for a World Tour licence in the first place? Cycling’s World Tour has had an air of baseball’s World Series given it’s hardly a global affair. As well as the two new Gulf races mentioned above, one headline change is the USA finally gets a World Tour race in the Tour of California so the sport is slowly spreading around the world. The new races to see the prime calendar reaching new parts of the world with the Tour of Turkey’s promotion too and the Ride London Surrey Classic. So five extra races in new places alongside awarding five races World Tour status in countries with existing races. Overall the picture remains very Euro centric, having a grand tour equates to a large slice of the calendar and other traditional cycling countries like Belgium and Switzerland get a large share too. The calendar can’t be contorted into some global perfection to match, say, population levels or GDP with the corresponding number of races and race days. Cycling can reach plenty of markets via established races. For example the Tour de France has been shown on TV in the USA, Australia and Britain for years, it’s not necessary for a new race to build up the audience… although it can help. But the additions to the calendar seem more about who wanted to apply rather than a concerted strategy, for obvious races the Tour of California is a more valuable proposition than the Tour of Turkey. As well as looking what’s there, spare a thought for what’s missing. Germany is still under-represented by some measures. Colombia would be a popular choice, it seems petty power squabbles are preventing new races there. Japan is due a World Tour race, it’s got passionate fans and represents a large target market for many bike brands such that teams without an obvious main sponsor interest in Japan, think FDJ or Movistar, could still be tempted in order to promote their subsidiary sponsors, especially bike suppliers. The World Tour label is slowly gaining acceptance as the mark of a premium label. The new additions risk diluting this especially if it’s confirmed that the new World Tour is likely to be the two-tier system with compulsory, existing events and the secondary new races. More on this is due out later this week or soon after and for now we can glance at the proposed calendar and count the days and note the locations. In this aspect the February gap is filled and the USA gets a long-overdue race too. But these additions are still at the margins and the sport continues to revolve around its major events, notably the Tour de France. June hardly seems light with both Tour de Suisse and Dauphine taking up half the month. They’re both great races and personal highlights but all the same hard to watch just as races because they’re so important towards the Tour de France. Put another way June is a warm-up for July. Yeah, the Dauphine is a weird race and to me does not belong in the WT. It feels like a testing ground for the ASO and/or a promoting event for the upcoming Tour. Pluss national championships gobble up the better part of a week in June for most European countries. Regarding point 2 – I believe that the inclusion of Dwars door Vlaanderen to UWT is merited. It’s part of the ‘Flanders Classics’ cooperative, if you like, and helps to promote Flemish cycling and the region in general. Look closely into the calendar and you will see that not only European countries use this date. 80% of the world does. Pari passu is crucial. A race is either WT or it isn’t. Having quasi-WT races makes everything even clumsier and more confusing than it already was. While I’m keen on a number of the new WT races I’d rather have a calendar that made more sense. The two-tier model can be seen as a practical idea. Before, good lower ranked events suffered from with unfamiliar names in the peloton. Now there should be some cross pollination. I’m not opposed to this. But as always with the UCI, the devil is in the undocumented details. I assumed that this is just as an intro and that after a couple of years the points will start to count… then a few years later when we’ve had a season where teams are fighting fro the points they’ll make them compulsory and no one will object because they were attending anyway. It’ll depend, the plan has been to shrink teams as in total squad size. We could see team size limited per race. But it’s all up in the air at the moment. There’s a UCI meeting today which is supposed to resolve some of this. And slightly off topic but it would also be better if it was called the ‘Men’s World Tour’, instead of the ‘World Tour’. This should apply to all sports i think. No more “FIFA World Cup” but the “Mens FIFA World Cup”, not more “Rugby World Cup” but “Mens Rugby World Cup”. Plus it would prevent some confusing between a WWT and WT, helping to mark them out as separate of equal status. They started the reform with the aim to avoid calendar clashes. And now they have a calendar full of clashes. They started with the aim to have a strong season long narrative. And they filled instead the calendar with events without points for the winner. What’s the narrative: This race is in-in but out-out? The clash between the Tour of California and the Giro go way back. Pat McQuaid once gave an interview essentially saying the Tour of California was taking the Giro’s place. Clearly, RCS was very out-of-favor at the UCI at the time. Given the guy behind the Tour of California runs it as a money-losing hobby, I’m sure the UCI has no problem taking his money, so everybody wins. It will likely take some time to see if anything changes. Sort of, Cairo Communications has bought RCS but the Giro is subject to particular ownership with the Bonacossa family, arguably the real owners of the race (http://inrng.com/2016/01/wealthiest-people-in-pro-cycling-2/) rather than Umberto Cairo. That’s quite obvious, isn’t it? The UCI has clearly adopted an target of getting new (rich) countries involved in cycling. Possibly even at the expense of traditional cycling countries, but that of course is debatable and remains to be seen. Purely coincidentally, those new markets have very little experience in cycling, so they “need” the UCI, look up to the UCI as “the authority”. If tomorrow the UCI ceased to exist, countries such as France, Italy, Belgium would still be organising successful bike races without the UCI. I wouldn’t be surprised if the UCI sees organisers from those countries as a burden. Qatar (et all) on the other hand… They do as the UCI say, don’t complain, and pay millions. On a side note: Regarding the UCI being “the cycling authority”: UCI recently awarded the Drenthe province in the Netherlands the (first ever) title of “UCI premier cycling region” (or something, I forgot the precise label they made up). I just laughed and compared it to Robin awarding Batman for crimefighting. Ok, thanks, now run along and play with your toys while we spend billions on all aspects of cycling each year. But to get back to the point: We can obviously expect more of these awards to be handed out in the future, to other countries/regions, including non-traditional ones. It’s another piece of the puzzle in the UCI wanting to become some sort of worldwide cycling Vatican, spreading the gospel around the world. And once they do, they’ll start charging regions for wearing those labels. And then, they’ll set up a consultancy which can help you achieve such a label. And then, they’ll start selling services to manage the infrastructure. Etc etc. No, I think races like the tours of Qatar and Oman need people like Eddy Merckx for credibility. Mainly they use the UCI to get on the calendar. PS slightly unrelated – even arguing with Fabian Cancellara in the heat under that overpass Eddy Merckx is still the ultimate pro. The profession bit from pro often gets overlooked by people who ride bikes as a hobby and live to judge people trying to earn a living. I don’t care much for the Middle East races or backers but I certainly don’t judge any pro taking their silly money. and staying in their ridiculous 5* hotels. Yes, it is obvious why they grow those events in Arabia – as my question was obviously rhetorical. But it´s still nonsense: In countries with a basic interest for cycling you could develop something bigger, as f.e. in the UK, USA, Germany, Japan, Argentina … In countries without a basic interest in cycling you can take a lot of money and buy events and riders. But this way will come no love for cycling and therefore nobody can develop cycling this way. It´s just firework – may be nice to see, but after a few minutes nobody cares anymore. We will know more tomorrow. Everyone wish us luck, fingers crossed we don’t have to revive Tour De Trump! What does _that_ mean?! If you are relying on the likes of “New York Times” or TV “celebrities” to get your “news” , you will get a _very_ one-sided and hysterical, hyperbolic view. There’s no one being rounded up & thrown in jail for expressing political views , as in Turkey or Venezuela. So the “Lock her up!” redderick was meant against the kurdish HDP or what? Happy whining tomorrow. HA! I was there and remember when they gave the “greasy orange turd” a bicycle. They might as well have given him a cow or a pogo stick! Soon enough, he handed the bike off to someone and said, “OK, now let’s go look at my boat.” Gawd help us all if he somehow becomes the leader of the free world!!! Races in fascist states are never a good thing. All the new races seem to either be well established and / or well sponsored, although I’m not sure of the finances of the Tour of Turkey, so in that regard they make sense as additions to the World Tour. And there are new teams, plus the opportunity to invite high quality wildcards, to these races. If criticism is made of a cluttered calendar, perhaps one should also look at the plethora of non-WT races that fills a substantial element of some WT teams racing commitments? These are the local events that make up so much of the sport, Sky has to do the Tour of Britain, FDJ needs to reach those parts of France no football match can, Movistar the same in Spain etc. And it’s not just the ‘local’ teams who want to participate in the ‘local’ races. It’s also the local riders. For instance, a Belgian sprinter prefers winning a stage in De Panne, Tour of Belgium or Paris – Brussels over a stage win in WT races in Catalunya or Turkey. Interesting replies and perhaps salient that you mention Belgium as an example. 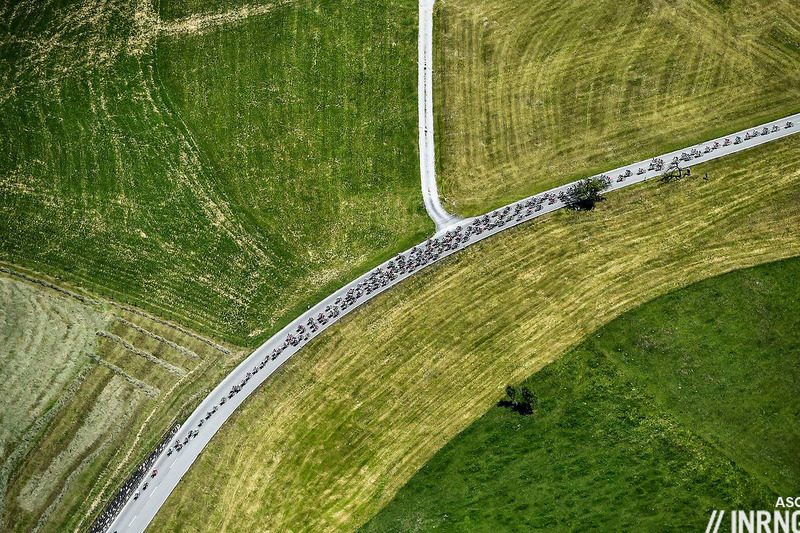 The Flanders Classics cooperative has been active in seeking inclusion to the WT for its races, the latest being Omploop, as a means of bolstering prestige and supporting its local racing scene. Contrast with the French where Madiot and the LCL seem to have taken directly the opposite view and are now threatening legal action against the UCI for the additional new races. Flanders Classics is a business like ASO, RCS etc not a cooperative. As for France, the French League represents all the races, think the Tour du Poitou-Charentes, the Roue Tourangelle, Paris-Camembert etc etc. As much as new races have been added, they can’t add many of these. But it’s unclear on what grounds the legal action is happening, eg is there a contract? A lack of consultation? It’s not clear. * Movistar took part in 23 x Spanish races from a total of 78 x races. Looking at these statistics (from PCS) the French do appear more insular. And they’re certainly not shy in racking up the number of races they take part in. I am unsure, what you mean with bias and what yours is. To use some isolated facts to bolster an idea and to leave out others is more than unhelpful. Better to look at the whole picture. Most things aren’t binary, surely not cycling. Ecky Thump, remember that France has many more races than other countries. When measured by race days it has double the number of the next country, Spain. With this in mind we can see why a lot of French races are worried about new events displacing them and why the likes of FDJ and Ag2r race at home a lot. Just interested, in light of the LNC’s criticism, to see how the French teams balance their season with, say, a commitment to competing in the French Road Cycling Cup which was 16 x races in itself in 2016. Is it just the fact that some of the new WT races are so far flung? Would there be the same resistance if the new races were around the borders of France; I’m not so sure? “The World Tour label is slowly gaining acceptance as the mark of a premium label.” Really? By whom? “Heinie’s Folly” was/is a pig and they can put all the lipstick they want on it but they’re fooling nobody – demonstrated by how some of these races are only “semi” World Tour. I still can’t figure out what the problem was (other than Heinie/UCI not having enough loot) that the World/Pro/Whatever Tour was supposed to fix? Has it accomplished ANYTHING other than driving up the costs to field a competitive team at the top level of the sport? When they booted Mr. Mars and his sidekick, the Mad Hatter out of the UCI I thought things would improve, but Cookson and Co. haven’t done anything to deserve being re-elected for another term. The only adults in the room are ASO and as much as I hate to see the French control the whole sport, perhaps it’s time? The sport’s currently rowing away, but with only one oar in the water, the world can see the results. “The globalisation of cycling is one of its (ASO’s) major areas of development”. ASO are also involved in the promotion of golf, motor sports and sailing events amongst other things. So I am not sure how that makes them a suitable governing body for cycling (let’s not forget the other levels below the WT too)? Ecky – I said I hated the idea of ASO controlling things…. would you prefer Velon? Sadly, ASO seems to be the only group with any sort of intelligent and coherent thought on the development of pro cycling at present. If you listen carefully to the interviews many (young) riders give these days it is obvious that the WT is gaining acceptance among riders, and fast too. It’s here to stay and it’s generally not a bad idea but I wonder if this sudden grab-bag addition of 10 races and 20-something race days, who might remain second-tier WT, isn’t going to harm that acceptance. They ought to let the acceptance of the WT grow further organically and maybe tackle some serious issues in the meantime like rider safety and stable team structures. I think it’s been a terrible (few) years for pro-cycling regarding all the race-incidents we’ve seen. Who’s going to populate the peloton in all those n’th-tier WT races if no sensible parent is going to send their kids to junior races out of safety concerns? That’s exactly what I meant, riders regularly talk about a World Tour race with a weight of assumptions, eg difficulty, speed, tactical lockdowns etc. Isn’t the World Tour actually for Road Racing what the World Cups are for MTB (XC, DH) and CX? Or at least, that’s what the UCI want in to be. They sure seem to (want to) treat it in much the same way. There used to be a world cup in road cycling too. It consisted of 10 top tier one-day races, this was before Anglo’s started using the ‘monuments’ moniker but it was obviously centered around those with a few additional long-standing classics like Paris-Tours, Zürich and Hamburg (if memory serves me well). To round it out to 10 a few odd races were included as well like the Wicaton classic (anybody remembers that one?). Anyway, it was a consistent package of tough (relatively) high profile one-day races spread around the season and Western-Europe (despite the ‘World’ epitethon, but this is traditional road cycling for you). This concept was ditched with the introduction of the WT which is more of an unnatural amalgamut of all different types of races but it does seem to gain traction in the peloton. Sagan for instance made it abundantly clear on more than one occasion this year that he considered himself the season’s best because he topped the UCI world ranking. Now if the UCI could just stop tampering with the concept for a few years and let the concept mature in the heads and hearts of fans and riders alike, it may work out to something everyone can endorese and even warm up to but this constant tampering with and bickering about is confusing and detracts from the core idea: generate a year-long narrative around the best riders and races road cycling has to offer. Nope, your memory tricks you only cause Hamburg named its 1996!! established race “Cyclassics”. For no reason. There is nothing classic in that race. I guess it was the Frankfurt race which was part of the world cup then. StevhanTI has nothing to worry about the powers of his memory. Hamburg was one of the ten classics from 1998 to 2004 – and it actually replaced Wincanton/Leeds International/Rochester which was of the 10-13 classics from 1989 to 1997. PS The Dutch Wikipedia is often the best and handiest source of information on road cycling races, pro and ex-pro riders, competitions and assorted history. Next step: package the tv rights. I know there are many problems with that, but it would be very good for the sport I think,especially for the smaller races on this calendar. How is Verbruggen back in charge of the UCI? He has been Honourary President since he stepped down in 2005. It’s only a ceremonial title, he doesn’t make policy or enforce anything or have any real or perceived power at all. Thanks for the link Zero! Some things never change, “Mr. Mars” is saying the same stuff he said back-in-the-day. As soon as I read essays citing F1 as something to emulate, I wonder what planet they live on? F1’s just dandy if you’re Bernie Ecclestone, but dwindling TV audiences, teams struggling to stay alive financially and competitively while more and more F1 races are held in sandbox countries controlled by autocratic petro-sheiks make me wonder how any of this would be good for pro cycling? From my perspective, the World Tour races shouldn’t be locked in but should run WT perhaps every other year or maybe for two – three years then off again. This would enable more locations to be included. Of course this is dependent upon races wanting to be WT. The gulf races make sense right now, but 5 years straight, no thank you. Mix in Morroco, Azerberjain, South Africa – and then perhaps February can get filled. I agree that especially Japan (and to lesser degree South Asia), could warrant a race. Would it be possible to add a 4th Grand Tour (2 week) – that rotated throughout the world – or combined two areas? I realize that there are Calender timing issues. A rotating system would be good Idea I think. Even withing GT’s: have one 3 week-long GT per year and two (or 3?) 2-week long GT’s and rotate between them every year. I need a World Tour wall chart and some packs of rider cards to swap with my mates so I can get excited about it all. Seriously!! Long time reader, first time poster, love your work inrng. Reading between the lines, would Tour of California and the like be happy about it not being compulsory for WT teams? They then have more space for local teams which surely the teams and organisers would be happy about..? I think it’s ok for California, many teams are keen to ride because the US is a huge market for the bike manufacturers. So the race will have no problem attracting teams and it can say to its own sponsors that it’s a prime event. But it will feel awkward trying to explain it’s on the top calendar but a second-tier event. The real problem is for other races, eg the tours of Qatar or Turkey which doesn’t offer as much, it’s more awkward for them. If we’re going down the road of a World Tour (which we are it appears) it looks to me like some decisions had to be made re calendar clashes and new world vs old world races. The UCI appear to have dodged every single one of these and tried to please everyone. So the existing calendar clashes remain and in some cases have been added to with a 3rd race run on the same day(s), new races in old world countries have been added along with races in new world locations with no interest in cycling. I don’t think anyone would have a problem with USA getting a race, but the Worlds highlighted the dearth of interest in cycling in the Arab states. Also I have a problem with what are effectively warm up races being elevated to the top tier (you could say the same about Paris-Nice, Tirreno-Adriatico and the Dauphine though if you were feeling unkind). To me its wrong as well when the ‘Cadel Evans Ocean Race’ is at a higher level than Paris-Tours. If the World Tour was to be expanded then a US race (potentially moved to avoid clashing with the Giro) and the Vuelta a Colombia would have been good. One day races… Strade Bianche maybe, Omloop maybe but instead of E3…. and I’d have added Paris-Tours and taken Plouay out. As an Englishman I’m up for a race over here but there are better places than Surrey. A one day Tour of Yorkshire taking in 275km of tough roads would be better than the existing 3 day race there. +1 I would ask how Strade Bianche Eroica Pro will be improved with a WT designation? It would be another of the Euskatel at Paris-Roubaix jokes. I’m still waiting for someone to describe the problem that the WT is the solution for. Meanwhile, we hear the season’s too long and too hard as an excuse for doping..but now winning a race in freakin’ JANUARY in Australia pays the same points as winning a Monument(?) Pro cycling is truly in need of adult supervision!!! No one has said what is exactly wrong to sticking to a traditional calendar in the traditional countries. They can add whatever races they like, and take away established races if they want to, but they can’t change the fact that cycling fans will get excited about the spring classics, then the Giro, then the Tour, then the Vuelta, then the autumn classics and the worlds. Whether these are in the World Tour or not doesn’t matter. Everything else is a warm up, which can be exciting in its own right as it signifies the start of the season like Paris-Nice, or just a bit of a side show to see us through to the next big race. There are plenty of other enjoyable races that in my opinion don’t need to be World Tour but are still good in their own way, I would put Omloop, KBK and the late season Italian one day races in that bracket. Totally agree Richard – whatever classification the UCI gives to the races in the season, there are the races that matter to the fans, and then everything else. The real hierarchy has nothing to do with WT status or not. As your example shows, KBK far outweighs a lot of WT races in my book. There’s absolutely no reason to not compel top teams to join on a would tour. I mean what’s the point? Lol. Or they could change the name of the event that fits it. On the authority of Sporza.be reporting: UCI confirms 18 teams in WT next 2 years (including DiData) and new WT races not compulsory next year. It’s official from the UCI today. There can’t be many sports where the rules about who can/can’t compete in the top level are set 9 weeks before the new season starts. As well as this there seems to be a new race on the calendar, a stage race in China for October but this is not official yet. Having more racing days might look good for the sport on paper (for the UCI and race organizers and sponsors), but in reality, riders will be worn out quicker towards the end of the racing calendar, or those back-end races, like the Tour of Taihu Lake or the Tour of Hainan, will be comprised of mostly B or C Team riders, so it makes for dull viewing. Increasing markets by brand exposure is a good thing, but the UCI should permit teams to expand their rosters, or permit more teams into the World Tour with a lower threshold, so that the cream of the crop in pro racing doesn’t have to be spread out so thin on top to cover the additional racing slots. Once again, another example of the lack of communication/coordination between the pro WT teams and the UCI/organizers of the sport. Thank goodness the Omloop Het Nieuwsblad (Het Volk) is back to February. There is nothing like racing in Belgium with snow on the cobbles. My experience racing in Belgium that early in the year is best left unsaid, however, watching the race and other suffering while having an excellent Belgium beer with a basket of frites with licorice or apple flavored mayo is one of life’s best things.